A 24-year-old male presented with a complaint of swelling in the left inguinal area for 6 months. The swelling was single, round to oval shape, slowly progressive in size over last 2–3 months. There was absence of any change in shape and size on exertion or straining. There was no history of pain and dragging sensation in the groin. On physical examination, the swelling was elliptical, measured 7 cm × 8 cm in size and confined to the left inguinal region only. Cough impulse was absent. Consistency was soft to firm and doughy feel present over swelling. The skin over the swelling was normal. Scrotum and both testes were normal. Other side of inguinal region was normal. Abdomen and per rectal examinations were within normal limits. Ultrasound showed well-defined homogenous rounded hypoechoic lesion in the left inguinal area measuring 5.3 cm × 4.8 cm × 3.7 cm with volume of about 50 ml (cystic lesion) [Figure 1]. Fine needle aspiration cytology of the swelling had features of the benign cystic lesion. Routine blood investigations were within normal limits. On exploration, a round cystic swelling found over the posterior wall of inguinal canal separated from the spermatic cord [Figure 2]. No direct or indirect hernial sac was found. The cyst was excised completely, and histopathological examination showed cyst lined by stratified squamous epithelium with preserved granular layer with retention of keratinous debris suggestive of epidermoid cyst [Figure 3]. Epidermoid cysts are either congenital or acquired. Congenital cysts develop due to failure of separation of ectoderm from underlying neural tube or due to abnormal sequestration of surface ectoderm at embryonic fusion site. Acquired cyst arises from the inclusion of epidermal structures into dermis and deeper tissue, for example, in trauma., In our patient, inguinal mass appeared to be a hernia sac at the first site of inspection which we tried to correlate to hernia. Any patient presenting with lump in inguinal area primarily clinches a diagnosis of hernia to the clinician as they are most common inguinal swellings. Differential diagnosis of inguinal swellings can be femoral hernia, undescended testes, lymphadenopathy, lipomas, saphena varix, varicosities, and endometriosis of round ligament and herniation of ovaries in females and rarely cutaneous cysts. Epidermal cyst in inguinal region is unusual and asks for a high degree of suspicion to make the correct diagnosis. In case of epidermal cyst, the patient presents with inguinal swelling which is generally nonprogressive or slowly progressive, soft to firm in consistency. They can be confused with hernial sac containing omentum as both may have doughy feel on palpation. Cough impulse is negative in cases other than inguinal hernias. As the cyst is irreducible, it can be misdiagnosed with irreducible or incarcerated hernias. They can also be confused with lipoma arising from spermatic cord, which are most common benign tumor of cord. A case of inguinal hernia typically presents with typical history and most of the times diagnosis is made on clinical examination only. On examination, a pear-shaped or spherical bulge in groin with cough impulse is present over the deep and superficial inguinal rings in indirect and direct inguinal hernias, respectively. Not able to get above the swelling and negative transillumination test differentiates it from hydrocele of testis. The index case-patient presented with elliptical nonreducible inguinal swelling with absent cough impulse. The dermoid and epidermoid cysts in inguinal canal are rarely present. Teratoma of the inguinoscrotal region is relatively common. Around 11 cases of dermoid cyst as a content of inguinal hernia have been reported. On gross look, the dermoid cyst and epidermoid cyst may look similar, but they differ microscopically. Both are ectoderm-lined inclusion cysts differing in complexity of structures they contain. Both arise from trapped pouches of the ectoderm, near-normal folds, or from failure of the surface ectoderm to separate from the neural tube. Histologically, epidermoid cysts are lined by keratinizing squamous epithelium. They are different from dermoid cyst by means of absence dermal structure-like hair follicle, sebaceous glands, and sweat glands. It is not always feasible to differentiate between these two as clinical manifestations are nonspecific and ultrasonography findings are not characteristic. Sonography is the primary modality for investigating inguinal masses in both male and females. 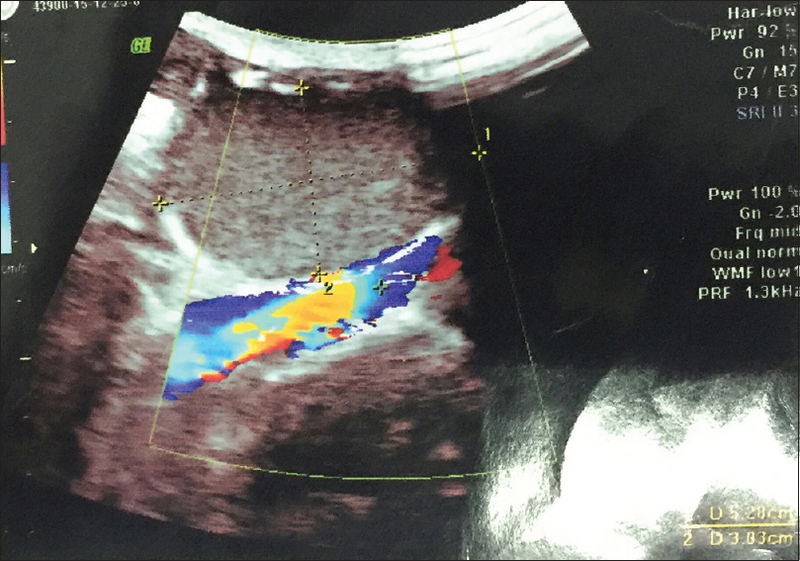 Ultrasonography with color Doppler is a quite useful modality to rule out differentials of cystic masses in groin of a female patient., In our patient, sonography revealed well-defined, round, homogeneous hypoechoic mass unlikely to be a hernia sac. After diagnosing cysts, surgical excision is the treatment of choice for inguinal cysts. On exploration of inguinal area in our case, a cyst over posterior wall found in the absence of any sac. Epidermal cyst presenting as inguinal selling is rare clinical entity but should be included in differential diagnosis of groin lump in both males and females. It can be differentiated from irreducible inguinal hernias by high degree of suspicion, clinical evaluation, and sonographic assistance. They need to be managed with surgical exploration and diagnosis should be confirmed with histopathology. 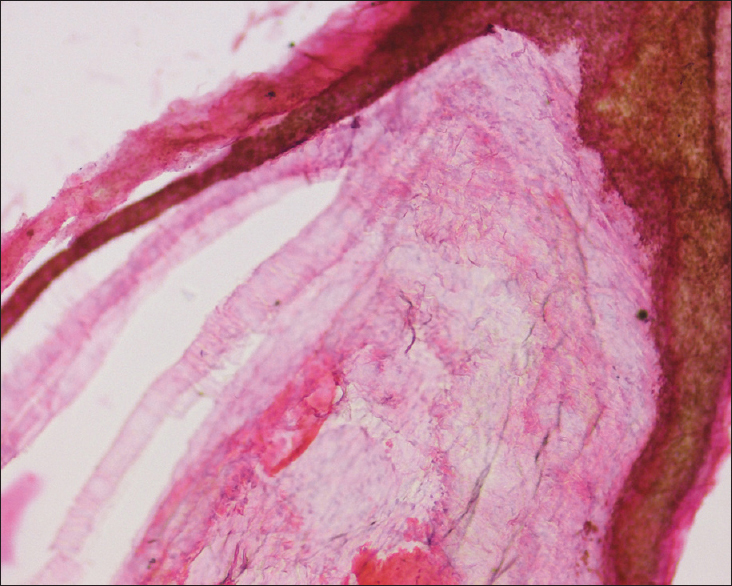 Handa U, Kumar S, Mohan H. Aspiration cytology of epidermoid cyst of terminal phalanx. Diagn Cytopathol 2002;26:266-7. Meher S, Baijal M, Soni V, Sharma A, Khullar R, Chowbey P. Epidermoid cyst at a rare location, as a content of inguinal hernia: A case report with a review of the literature. J Minim Access Surg 2016;12:286-8. Poenaru D, Jacobs DA, Kamal I. Unusual findings in the inguinal canal: A report of four cases. Pediatr Surg Int 1999;15:515-6. Yang DM, Kim HC, Lim JW, Jin W, Ryu CW, Kim GY, et al. Sonographic findings of groin masses. J Ultrasound Med 2007;26:605-14. Oh SN, Jung SE, Rha SE, Lim GY, Ku YM, Byun JY, et al. Sonography of various cystic masses of the female groin. J Ultrasound Med 2007;26:1735-42. Tanaka T, Yasumoto R, Kawano M. Epidermoid cyst arising from the spermatic cord area. Int J Urol 2000;7:277-9. Katergiannakis V, Lagoudianakis EE, Markogiannakis H, Manouras A. Huge epidermoid cyst of the spermatic cord in an adult patient. Int J Urol 2006;13:95-7. Lee SJ, Lee JH, Jeon SH, Kim MJ. Multiple epidermoid cysts arising from the extratesticular scrotal, spermatic cord and perineal area. Korean J Urol 2010;51:505-7. Gordon AC, Mikel JJ. Epidermoid cyst of the spermatic cord. Pediatr Surg Int 1990;5:69-70. Kim T, Feranec JB. 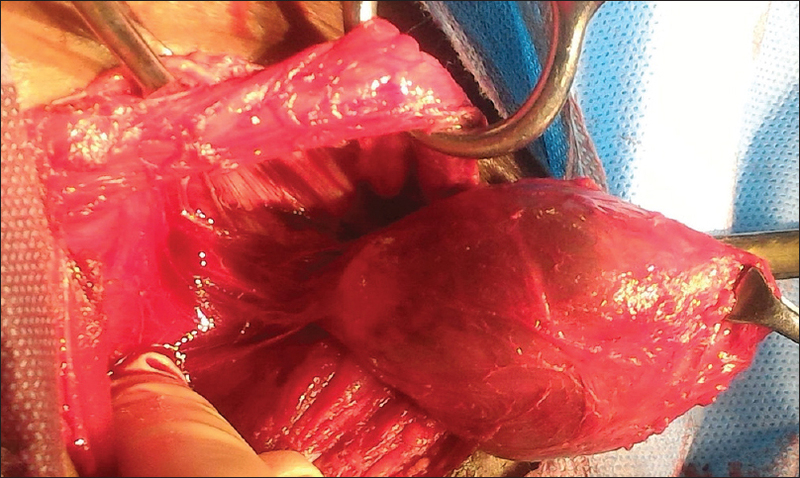 Epidermoid cyst of round ligament: Case report and review of literature. J Minim Invasive Gynecol 2011;18:126-7. Vázquez F, Núñez R, Díaz P, Blesa E. Epidermoid cysts of the spermatic cord. Cir Pediatr 1995;8:170-2. Epstein WL, Kligman AM. Epithelial cysts in buried human skin. AMA Arch Derm 1957;76:437-45. Papanayotou PH, Kayavis JG. Epidermoid implantation cyst of the lower lip: Report of case. J Oral Surg 1977;35:585-6. Farrands PA, Taylor I. Unusual groin swellings. Postgrad Med J 1984;60:309-11. Surriah MH, Muneer QA. Dermoid cyst of the spermatic cord: A rare case of benign inguinal lump. Iraqi Postgrad Med J 2013;12:315-20. Humphrey P, Dehner L, Pfeifer J, editors. The Washington Manual of Surgical Pathology. 2nd ed. New Delhi: Wolters Kluwer India Pvt., Ltd.; 2012. p. 7. Rattan KN, Kumar S, Gahlawat S, Agarwal S, Kaushik S. Dermoid cyst of spermatic cord: An uncommon presentation in a child. Ann Diagn Paediatr Pathol 2008;12:37-9.